You could write an entire book on the benefits of regular exercise. Physical exercise helps us to manage our weight, reduce our risk of heart disease, enhance our mood, boost our energy, and promote better sleep, just to describe a few examples. But what about our hearing? 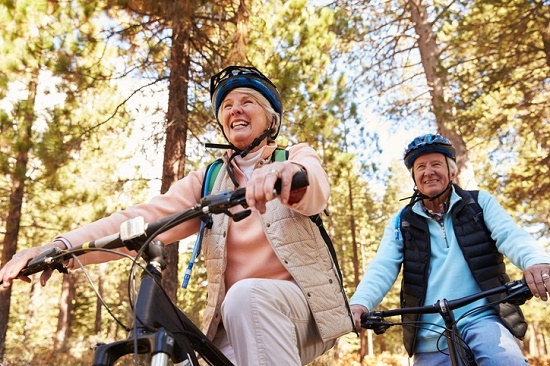 Can exercise also protect against age-related hearing loss? According to a new study by the University of Florida, we can add improved hearing to the list of the perks of exercise. Here’s what they found. Researchers at the University of Florida started by sorting the mice into two groups. The first group of mice had access to a running wheel and the other group did not. The researchers then calculated how far each of the mice ran individually on the running wheel. On average, the group of exercising mice ran 7.6 miles per day at 6 months (25 human years) and 2.5 miles per day at 24 months (60 human years). Researchers then compared this group of exercising mice with the control group of less active mice. Researchers compared the markers of inflammation in the group of exercising mice with the group of sedentary mice. The exercising group was able to keep most indicators of inflammation to about one half the levels of the sedentary group. Why is this noteworthy? Researchers think that age-associated inflammation damages the structures of the inner ear (strial capillaries and hair cells). In fact, the non-exercising mice with increased inflammation lost the structures of the inner ear at a much faster rate than the exercising group. This caused a 20 percent hearing loss in sedentary mice compared with a 5 percent hearing loss in the active mice. For humans, this means that age-related inflammation can injure the structures of the inner ear, bringing about age-related hearing loss. By exercising, however, inflammation can be lessened and the structures of the inner ear—together with hearing—can be preserved. Additional studies are ongoing, but experts believe that exercise inhibits inflammation and generates growth factors that help with circulation and oxygenation of the inner ear. If that’s true, then regular exercise may be one of the most useful ways to lessen hearing loss into old age. Close to two-thirds of those age 70 and older have age-related hearing loss. Determining the factors that lead to hearing loss and the prevention of deterioration to the inner ear has the potential to help millions of individuals. Stay tuned for additional findings in 2017.